Chateau / Country House1506 sq. ft. Located on top of a small hill, set in beautiful unspoiled Tuscan countryside and within walking distance from the charming medieval town of Arezzo, this beautiful, private mansion with swimming pool commands amazing views from its terraces and gardens. The house, of about 140 square meters, is on two levels and consists of 2-3 bedrooms, two bathrooms, kitchen and living room. It can accommodate a maximum of 7 people. The Villa has recently undergone renovation, furnished in very good classic Tuscan taste and yet offering every modern comfort. In case of groups contact us! From the moment we arrived we knew this would be a special holiday. Gabriele, Maria and Paolo were the perfect hosts and we were very lucky to have booked with them. The villa was outstanding, and anything that extra we needed Maria kindly loaned. The pool was beautiful with stunning views over Arezzo. Took a fast train to Rome for a day, drove to outside Florence and caught the tram into town, drove in the evenings to Siena, Montepulciano and Arezzo. An amazing magical place... can't wait to go back. Thanks Sarah for your nice words, our door is always open for you and your amazing kids. We had a wonderful vacation at Limonaia. The house was comfortable and welcoming and our hosts were delightful. It was a picture perfect setting. While the house could hold more than the three of us, we found the accommodations were just perfect for us. The pool was an added bonus at the end of some very tiring and hot days as tourists. Loved the mornings and the ability to cook our breakfast and take our time getting the day started. Our hosts were very gracious and helped with any issues. We would recommend this villa to anyone looking for a convenient spot to do day trips. We did Arezzo, Pisa, Florence, Assisi, and Siena. All were easy drives. We would take our host's recommendation and take a train to Arezzo and then rent a car instead of renting in Milan! Much easier. Thank your for your feedback, it was a great pleasure having you here at our place. See you soon, take care! We had a fabulous stay at casa limona- highly recommended! The property is in excellent condition and a perfect place to stay for families and couples. The swimming pool and gardens are in immaculate condition and stunning to sit at. It's really well placed to visit places in tuscany including florence, Cortona, the lakes and we even went to Rome for a day. Paulo and Maria are wonderful hosts who are exceptionally helpful. We would definitely recommend a visit!! Thank you for staying at our place, we are very glad to have met you! The property and gardens for the two houses are immaculate. The swimming pool is gorgeous located above the two houses with long views across the valley to the town on Arezzo. There is a private house [Limonia] below the pool and a lovely larger house just below Limonia with the owners Maria and Paulo living on the ground floor. Both properties are lovely, as evidenced by the pictures. The larger house has a beautiful, spacious apartment on the second floor where we stayed with a full kitchen, living room and a dining area looking over the valley. 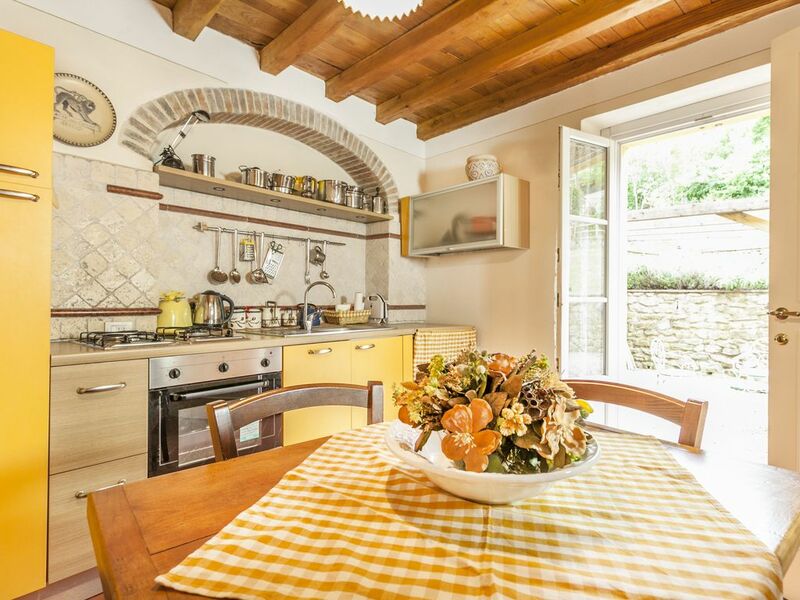 Arezzo is a lovely city that is not spoiled by tourists with much to see.The property is located within reasonable driving distances to many popular tourist locations such as Siena, Multipuciano, Cortona and Florence with the advantage of quiet and calm after a day of visiting. Maria, Paulo, and their son Gabriele were incredibly helpful and generous with their time making suggestions for visits that only a local would know about, adding to the adventure. Thank you very much for staying at our place, it's been a great pleasure to have met you! We hope to see you again in Italy soon (and why not in Quebec one day). We spent two weeks at Casa Limonaia. It was our first visit too Tuscany and the villa was ideally located to visit the beautiful hilltop villages and the more well known cities such as Florence, Pisa and Sienna to name just a few, we even managed a visit to Rome, as the train links from Arezzo and Florence are excellent. Our hosts Maria, Paulo and their son Gabriele were most kind, helpful and hospitable. They were always there if you needed anything or needed to ask them anything about the surrounding area, but they were not intrusive. Maria's cooking was a treat, true Italian food. We thoroughly enjoyed our stay at Casa Limonaia, it was made even more enjoyable by our wonderful hosts. Our only regret was that we could not have stayed longer. "La Limonaia … a realy great, quiet place to stay near the beautiful city of Arezzo which is absolutely worthwile visiting. The nicely restored house, the private terrace and the wonderful located pool offer every comfort for a fine holiday in a great Tuscan atmosphere. In addition the sympathetic and friendly owners have surely contributed to making our holiday a success while at the same time assuring enough privacy. We cherish the nice memories and would love to come back one time. La disponibilità, cortesia e simpatia dei proprietari rendolo il soggiorno veramente da 5 stelle!" From Arezzo: follow directions for SIENA/PERUGIA, turn right to AGAZZI/BAGNAIA/VIGNALE, get to BAGNAIA and turn left. From the A1 highway: follow directions for AREZZO, exit at PONTE A CHIANI and follow for AGAZZI.